I really was not sure what to expect from Lee Heinrich‘s “Shooting Star” class. She was definitely prepared and ready to talk about her passion for creating beautiful traditional blocks/quilts with decidedly modern twists. We learned two different ways to make flying geese. And she taught paper piecing (yes, I believe I was the only one in the class who had not done paper piecing before). And it was great! 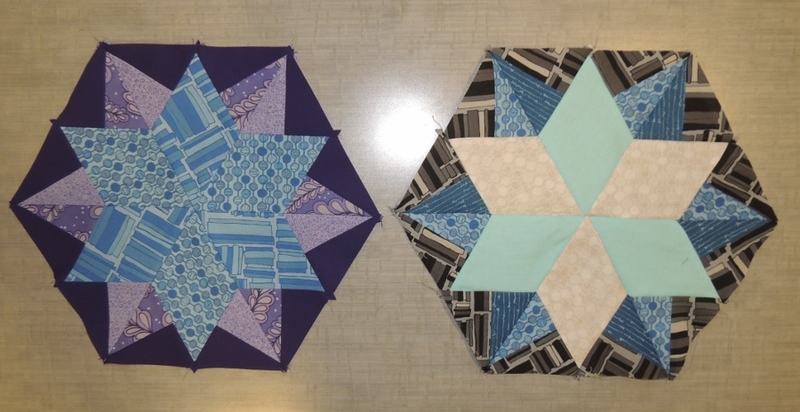 I learned a lot about several techniques, I absolutely fell in love with one block we made to create this pieced top, and it felt oh so good to finish the project in the class time! Julie Herman‘s Sidekick Sampler Workshop was the last class that I took at SewDown Portland. She took care to demonstrate her sidekick ruler at the beginning of class, and we had time to practice using the ruler before digging in and creating a pieced block. As I mentioned in my write up for Saturday, Julie did not get her shipment delivered as expected and she had to improvise over the weekend. She did so with grace and the help of friends. I had a fantastic experience at SewDown Portland, and I have a bunch of new projects to wrap up! I am really looking forward to taking what I learned and applying it to other projects in the future, too.